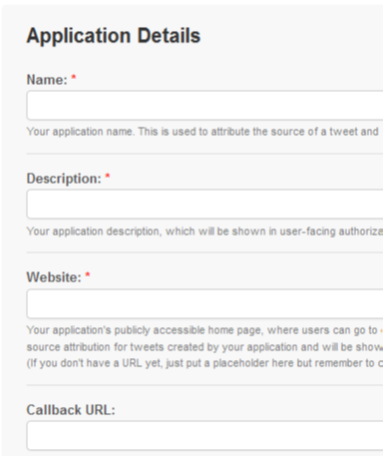 How to create a twitter application. How to get OAuth tokens. How to authenticate users whenever he logs in. How to create a Twitter Application? Step-2 : Sign in with your twitter account. Step-3 : Go to https://dev.twitter.com/apps and click Create a new application button. Step-4 : The following page will load and you will fill the fields specified. Name -> Name of your App. Description -> Description of your app. Website -> Site where this app will be available or where info of this app will be available. Callback URL(Optional) -> This is the URL where the user will be redirected after he authorizes your app. How to get OAuth tokens? Step-2 : Note down the both keys and save it. Never let anyone know your consumer key or secret except you, it may lead to misuse of your app. Step-1 : Download twitter OAuth library for PHP from following link and include in your code. Step-2 : Create a TwitterOauth object using your consumer key and secret key. Step-3 : Request Access tokens for the app. Specify your callback URL, if you left it blank while creating app. Step-4 : User logs in and approves your app and twitter returns with â€œoauth_tokenâ€ and â€œoauth_token_secretâ€. Please be aware that these tokens are different from your consumer token and secret. Step-5 : Authorize URL is called to authorize currently logged in user to use your application. Step-6 : After Authorization, twitter will send oauth_verifier code. Step-8 : Now you will get permanent oauth_token and oauth_secret for the user. Which you can save in database and user need not authorize the app everytime. How to Authenticate user whenever he logs in? Step-1 : Include twitter libraries in your code. Step-2 : Get user oauth_token and oauth_secret which is stored in database and use following code to get twitter oauth object. Step-3 : Using the $connection object now authenticate user using following code. Step 1 : Your App requests User permission. Step 4 : Your app can then do all the twitter work (tweet, retweet, follow, unfollow etc..) behalf of the user.